When is an AGM not an AGM? On Wednesday night, the Labour Party Irish Society (LPIS) – an affiliated Labour society with the ability to delegate members to constituency Labour parties and influence decisions and candidate selections – held its AGM. It was reportedly a disgrace – and a number of Labour MPs and officials have serious questions to answer about behaviour that, if multiply-sourced allegations are true, shows utter contempt for democracy and the party’s/society’s membership. [Progress members came out to] pick their mates from the queue to go through the staffers’ entrance and occupy all the seats in the room, leaving dozens of fully paid-up LPIS members outside the building or outside the rooms in which the AGM was being held. While paid-up LPIS members were left outside, such denizens of the Irish community as Stephen Pound MP, Chuka Ummuna MP, Stella Creasy MP, Siobhan McDonagh MP and dozens of suited and booted lanyard-wearing SPADs sat comfortably inside. At one point, Stephen Pound MP even came out and told people, inaccurately, that the AGM had been cancelled! Dozens of LPIS members, not believing that an MP of all people would peddle lies, headed home at this point. Even though RSVPs were in excess of 100, the room booked (capacity 70) was not enough. A second room was procured, but even so, dozens of members were left outside in the corridor and denied the opportunity to register for the AGM. Even candidates from the left ‘slate’ were denied entry according to the full report. I received this from Austin Harney of LPIS. It looks like AGM last night was hijacked. There will be a letter of complaint coming in. 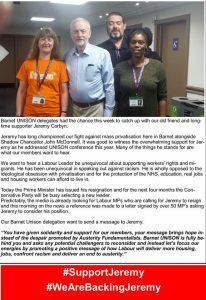 We need NEC members now calling upon McNicol to launch inquiry. Sooner rather than later. Hi. Unfortunately, it did not go well. The room was overcrowded with Progress people, MPs, Lords, Baronesses and Labour officials. They were going to turn many of us away but had to open up a second room. Many Momentum members were not allowed in including some of our candidates. Also, we had Stephen Pound at the entrance telling many Momentum members that the AGM was cancelled. I raised a point of order at the beginning of the AGM calling for it to be postponed because the room was not big enough. I was heckled but I held the floor. I had to go in the second meeting in the Thatcher Room and raise the point of order, there. In both rooms, we were outvoted. Amongst the MPs were Siobhan McDonagh, Chuka Umunna, Vernon Coaker, Stella Creasy, Stephen Kinnock, Streeter etc. There were many with no Irish connections at all. Conor McGinn was seen remotely running around and getting his own cronies to come in. This incident won’t go away. We intend to draft a letter of complaint to the NEC and call for the AGM to be declared null and void. Are people aware of what happened at the AGM of the Labour Party Irish Society? This is appalling. Can we do anything? See account below. I was in PCH [Portcullis House] and am therefore aware of some of the shenanigans. I am writing to you as i am appalled by the obviously corrupt events which took place last night at the Labour Party Irish Society AGM. I am a fully paid up member of the LPIS, Labour Party and RSVP’d to the invitation to attend the AGM. After standing in the queue for about half an hour, Steven Pound MP came out of the building and said the event had been cancelled – a large number of comrades left the queue at this point. Luckily, I checked my messages and a comrade that was inside had sent me a text that there was an overflow room being made available – I challenged Mr Pound with this and he look quite startled – and went back inside – he later came out and said that the AGM had not been cancelled – He then proceeded to usher in people who had joined the queue after us into the meeting , he did this a number of times and i did attempt to ask what was going on and why were people behind me in the queue being ushered in , but he just ignored me . Eventually we managed to get into the building and cleared security – we went upstairs to be told that the overflow room was now full and that we would not be let in – effectively, we had been locked out of the meeting with at least 20 other comrades. What makes this even worse is that comrades inside the meeting were not having their credentials checked in any way to establish if they were Labour Party members, Labour Party Irish Society Members or had RSVP’d . No register was taken of participants in the meeting . So who exactly was in the meeting? Were they even members of Labour? It appears that no one knows. So how can this travesty be allowed to stand as an AGM? In my view it cant! The LPIS AGM should be declared null and void. A new AGM should be arranged where democratic process is followed. The NEC must take action – and any MPs and Labour officials found to have participated in this affront to democracy must face the maximum available sanction. 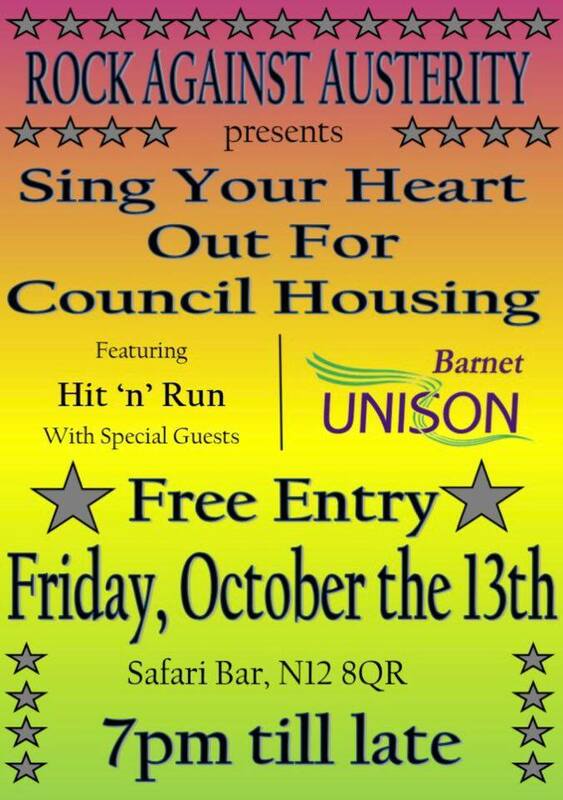 Please share this & help Save Barnet Libaries gather evidence on the impact of the libraries cuts. 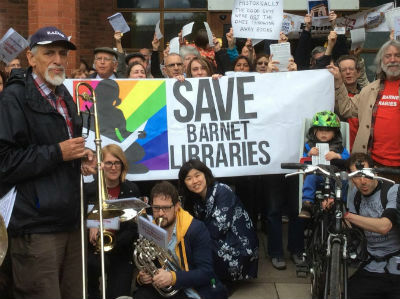 The Government is considering whether Barnet Council has broken the law which requires them to run “a comprehensive & efficient” library service. 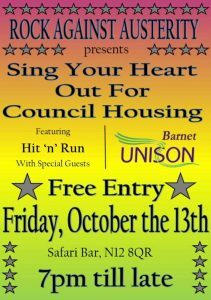 This follows from a formal complaint submitted to the Department for Culture Media and Sport by the Save Barnet Libraries campaign. You can help persuade the Government to rule against Barnet Council by filling out this form on the SBL website >> And SHARE it! 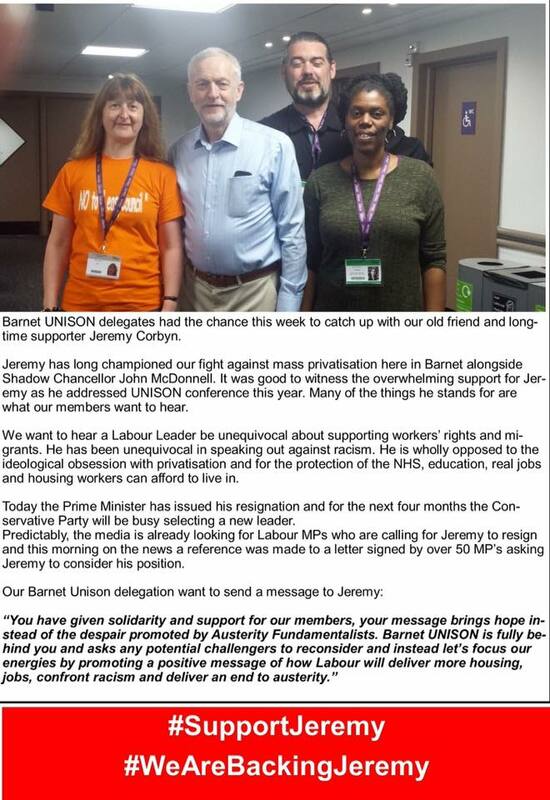 Barnet Trades Union Council fully supports Jeremy Corbyn’s candidature in the upcoming Labour Party Leadership Election. We deplore and condemn the lack of democratic process being exhibited by the Labour NEC in relation to the impending Labour Leadership Election. Disenfranchisement of full Labour party members who have joined the Party since the end of January – even though it was clearly stated upon them joining as new members they would have a vote in any future party elections taking place. This also call into question the legitimacy of any Branch Meetings, CLP All Members Meetings, Annual General Meetings and Local Campaign Forum Meetings which have been convened if new members who joined since the beginning of February had an active role and participated in voting. The assertion by the NEC that Supporters of the Labour Party who pay £25 by the 15th of July WILL have a vote in the Leadership Election even though full members of the Party who joined after the end of January will not. This will also disproportionately effect people who will struggle to pay £25 at short notice – the very people who the Labour Party are meant to represent. NEC’s instruction that CLP, Branch and Local Campaign Forum meetings do not take place until after the Leadership Election is completed. # Meetings solely for the purpose of making a supporting nomination. # Campaign planning meetings for by- elections or devolved mayors. This is unacceptable and goes against the Labour tradition of inclusive Democracy. We call upon the NEC and Local Labour Parties to reinstate Democracy in the Labour Party and to overturn these unconstitutional, anti-democratic, usurping of Labour Party rules. (map) Kevin Courtney, Acting General Secretary, NUT, Madeleine Holt, Rescue Our Schools, Aislinn Macklin-Doherty, BMA, John McLoughlin, UNISON LG executive member, Mark Campbell , UCU London Region. We will be taking our next day of strike action on Tuesday 5th July as part of the ongoing campaign in pursuit of our pay claim to address the 14.5% fall in our wages in real terms since 2009. The 5th July date has been chosen for maximum impact across London with many HE institutions also on strike that day. Those of you with school-age children may be aware that the National Union of Teachers will also be taking strike action on the 5th in their separate dispute with their employers. A more detailed email will follow but the plan for the 5th is that Middlesex University UCU will conduct a “Teach Out” on the Burroughs on the morning of the 5th (the day of the Annual Teaching and Learning Conference at Middlesex). Our “Teach Out” will address the government plans in the White Paper for HE and we will discuss the alternative vision for HE as seen by UCU, the Council to Defend British Universities and other organisations. We hope to have a speaker from Middlesex Student Union to give us the view of the student body and to tell us about the growing national concerns about the retrospective rise in the interest rate on student loans etc. There will be other opportunities for creative learning during the morning with interesting options for those of you who might need to bring your children to the “Teach Out”. In the afternoon there is likely to be a pan-London event involving a range of education unions. More detail on this in a later email. You are the UCU. Do be part of the 5th July – this will be the liveliest picket ever. Picket Lines 8-12pm on 5th July at the front of the university. Unison believes the attack on him is misjudged ,mistimed and indulgent . After a devastating Referendum result ,it is vital that our labour MP ‘s return to their constituencies to begin to heal the dangerous fault lines that have split poorer working class communities and not be hidden away in the corridors of Westminster plotting against an elected leader with an overwhelming mandate. “Trade unionists and Labour Party members will be baffled and angry about these resignations that appear to have been coordinated to cause maximum damage. It is bizarre that some of the MPs making the loudest criticism of Jeremy Corbyn over the referendum completely failed to convince the electorate in their own constituencies. Those Labour MPs plunging their party into an unwanted crisis are betraying not only the party itself but also our national interest at one of the most critical moments any of us can recall. The Tories are reaping what they have sown and are going to be consumed with divisions for the rest of the year and beyond. The other EU states are pushing for the British government to give effect toThursday’s vote to leave as rapidly as possible. Great decisions need to be made by a government that is effectively paralysed. Surely Labour’s priorities are first of all to ensure that Brexit is not at the expense of working people, that employment rights are secured and jobs protected. We need to fight might and main against those Conservatives who see Brexit as a mandate to introduce a free-market utopia at the expense of working people. We also have a responsibility to speak out against racism and offer reassurance and support to people of all races and nations living in Britain today. And we need a clear Labour perspective for life outside the EU in the years ahead, looking to the opportunities as well as the very real threats, including the opportunity for a more interventionist state acting to prevent jobs losses, acting to use public investment to shape the economy of the future and prevent jobs losses, like those looming over Tata Steel. Instead, Hilary Benn and others have decided this is the moment to let the Tories off the hook, turn Labour inwards and try to set aside the overwhelming result of a party leadership election held less than 10 months ago. It seems clear that this coup would have been launched irrespective of the referendum result. Anyone who thinks remain would have won the vote if Jeremy Corbyn had told traditional Labour areas that all was well with the EU and with globalisation is living in a dream world. It is easier to do that from an oligarch’s yacht or a bank boardroom than it is in our de-industrialised cities and towns. In fact, Corbyn was honest and straightforward about a complex question. There is no more sense in blaming him than there is in blaming Margaret Hodge for the fact that her constituency was one of the very few in London to vote to leave the EU. And while I would agree that Labour needs a very different message concerning the free movement of labour, criticising Corbyn for this comes ill from those who have always argued that Tony Blair’s open door policy was a progressive one. Unite has been warning about working-class alienation from politics all this century. There was the plummeting turnout in 2001 general election, the further Labour core vote losses in 2005 and 2010, followed by the growth of Ukip. How many canaries did this coalmine need? Corbyn is a brave and principled man, better placed to address this crisis in Labour’s heartlands than any of his critics. Of course he needs to broaden his message so Labour can reach out with a radical message of change for all working people, including those “left behind”. But does anyone belief that refried “new Labour” will work better? I would like to see all Labour MPs playing a full and constructive part in this urgent work of communication. However, if people want to resign, so be it. Labour has plenty of talent to bring forward, women and men committed to the sort of alternative the party voted for last year. The truth is that some of those trumpeting their resignations owe their stature to being in the shadow cabinet, not the other way around. A new leadership election is divisive and unnecessary. But if enough MPs want one, then bring it on. I am sure that Corbyn will secure a fresh mandate. But let me make two things clear. First, if anyone is undemocratic enough to think that there can be a new leadership election with the existing leader kept off the ballot, then they are setting the Labour party on course for a split. And second, Unite has hitherto opposed any plans to change the party rules governing mandatory re-selection of Labour MPs. That, too, we have looked on as a divisive distraction. But those MPs who have missed no opportunity to tweet and brief against the party’s elected leader over the last 10 months will find that their disloyalty finds no favour with party members and will make this an increasingly difficult line to hold.